"Then and Now" is a monthlong series by Alan K. Lathrop, curator of the Manuscripts Division at the University of Minnesota Libraries from 1970 to 2008. He is author of Minnesota Architects and Churches of Minnesota. Sir Tyrone Guthrie brought Broadway-caliber theater to the Twin Cities, and for that a host of theater lovers, past and present, are forever in his debt. He spent years searching for a suitable location for his repertory theater and selected Minneapolis in 1960. 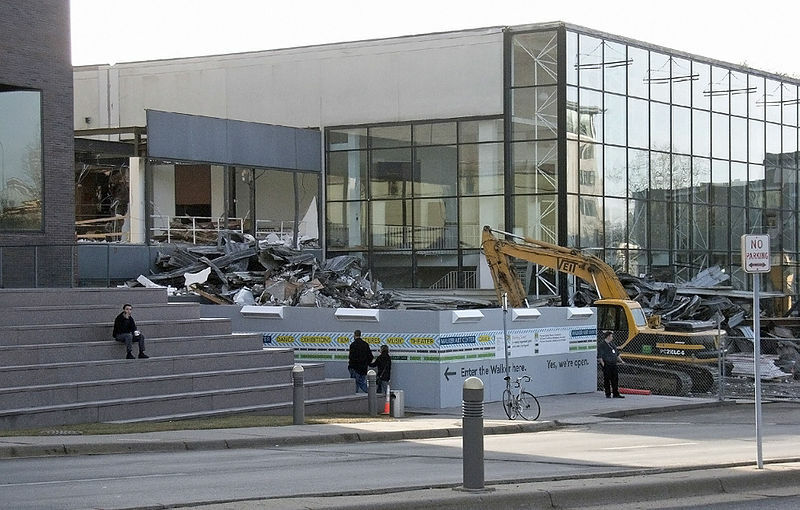 A site was found adjacent to the Walker Art Center, on Vineland Place, across the street from Parade Stadium. (Parade Stadium, and the Parade Ground before it, was the former site of the first Minneapolis Armory. The land under it was marshy and soon after the Armory was finished in 1888, it began sinking, causing so many structural weaknesses that the building finally had to be abandoned in 1929. A new Armory was constructed on South Sixth Street in 1935 on firmer ground. It still stands today.) The Walker had built a model house on the site (model homes were popular in the 1950s), then demolished it. 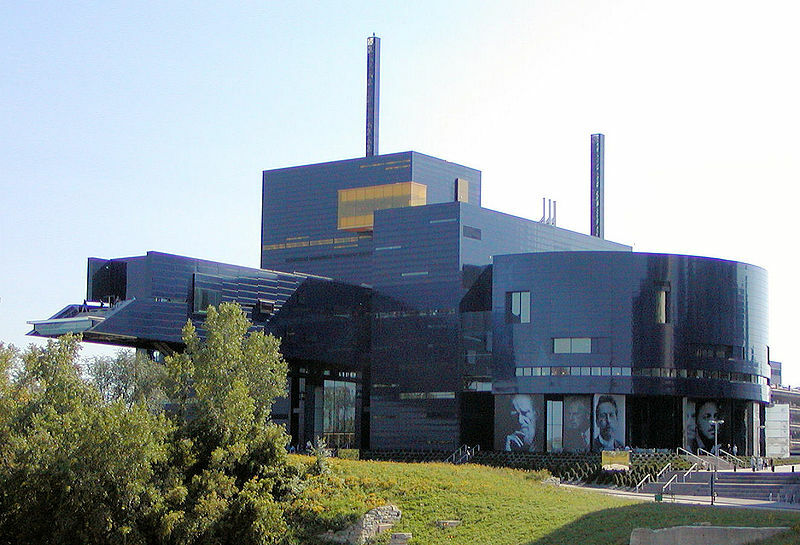 Noted local architect Ralph Rapson, head of architecture at the University of Minnesota for many years, was chosen as architect of the theater. He produced a classy, graceful, intimate structure that opened in 1963. 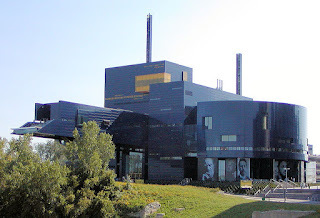 Rapson’s design proved workable and attracted audiences. Its biggest failure was a screen punctuated with random openings through which the theater behind it peeked out seductively at the world. Rapson and Sir Tyrone clashed on several issues concerning the design, the climax coming over a disagreement about the color of the fabric on the seats. Rapson wanted multiple colors that would add warmth and variety to the matte black of the theater interior; Sir Tyrone argued for one color. When he made a trip back to Ireland, Rapson ordered multi-colored fabrics and the seats were installed by the time Sir Tyrone returned. He is reported to have blown his top and fumed for days afterwards. In retrospect, Rapson’s choice was absolutely correct. However, for the rest of his life, he would find a way to work a drawing he made of Sir Tyrone with Devil’s horns protruding from the sides of his head into slide presentations of the Guthrie Theater. The new theater, designed by Jean Nouvel of France, has had both high praise and sharp criticism heaped on it by admirers and detractors. Admittedly, it was built to be iconic, and the building’s huge scale is more in keeping with the historic industrial landscape of the riverfront. The dark skin evokes the night when playhouses come to life, its interior subtly lit through yellow glass windows, as if it were illuminated by candle light. It presents mainly a blank wall to the outside world, punctuated with a few windows, as if it wants to keep its activities secret and away from the general public. The large walls are quietly illustrated by images of past productions and playwrights, and the building and its nearby parking ramp (housing the scene shop) are surmounted by two light towers that advertise current plays, all in an effort to break the monotony of the big blue block. Present-day theater architecture is going the other way. The Lincoln Center, for example, has recently remodeled and replaced its solid walls with glass in an attempt to give the sense of activities invitingly flowing from outside to inside. Only in the Guthrie’s street-level bar and restaurant area does one feel this kind of transition. Interior lobby spaces are unnecessarily dim and gloomy even though lighting has been upgraded, and traffic flow continues to be confusing. “Postcard view” yellow glass windows offer intriguing peeks at the Falls of St. Anthony, an intriguing idea that (intentionally or unintentionally) serves to isolate the viewer from the scene, leaving it remote and unattainable as if one were watching a play in which participation is impossible. Seat colors in the theaters are monochrome. A parking ramp across the street is connected to the theater by a skyway, but it is not a public skyway; it serves to shuttle sets from the design shop to the shallow backstage areas. As an icon, the building works, but the overall feeling is one of oppressive heaviness. The old Guthrie always felt light, airy, comfortable, and inviting. 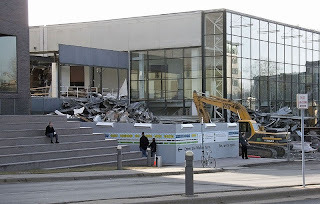 Unfortunately, the new one does not convey those sensations, although a deeper concern is whether the new building will stand the test of time. It might need to undergo major alterations and adaptations, as did the old one, to make it continue to be attractive and functional. Time will tell. Alan K. Lathrop is author of Minnesota Architects (2010) and Churches of Minnesota (2003). -The Hollywood, Uptown, and Varsity theaters in Minneapolis. Want to know the architectural history of your favorite Minnesota building? E-mail suggestions about content you would like to see here to sattl014@umn.edu. Photos on this post are from Wikimedia Commons. In The New Yorker — this image look familiar? What's Eric Dregni up to now?